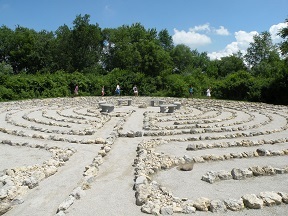 Enjoy diverse labyrinths and gardens in nearby Rockford, Illinois. Help create a choreographed birdseed classical labyrinth at the renowned spectacular Anderson Japanese Gardens plus curator tour; weave through pines and prairie to the impressive Womanspace rock labyrinth; experience the SwedishAmerican Regional Cancer Center sensory garden and medieval style labyrinth, plus a unique Rotary wheel double path installation. Barrie Carter Gibby works on that creative edge between the branches of words and movement expression. A long-time educator, community builder and labyrinth facilitator, Barrie interweaves her extensive background in theater, design, music, ritual-making and spiritual pilgrimages to Europe to facilitate workshop gatherings on methods of Building Community and the pilgrimage world of the Labyrinth Journey of Embodied Spirituality in North America. As an Advanced Certified Veriditas Labyrinth facilitator, Barrie finds sacred spaces everywhere.